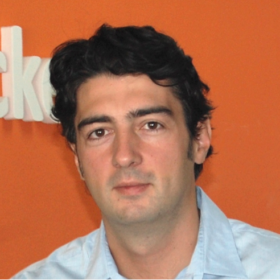 Javier Andrés is the founder and CEO of Ticketea. He was born in Logroño, a small town in the north of Spain. The son of a nurse and a business man, he always loved trying to do things differently. When he was 16, he spent his junior year at an Indiana Highschool in the US where he lived with a host family, of which the father was a self-made man running a small business. This experience had a significant impact on Javier and helped shape him into the person he is today. Back in Spain, he went on to study at ICADE (a leading Spanish university) where he obtained his Bachelors degree in Business Administration. During his senior year (2003) in college he was selected to go abroad and spend the fall semester in the US at Tulane University. In 2008, Javier completed a part-time Masters in Digital Business at the Instituto de Empresa in Madrid while working for Havas Media. He graduated in the top 20% of the class and his final project for the Masters was the business plan for Ticketea. Ticketea is a marketplace for ticketing that helps event coordinators to promote their events and sell access to them online. Ticketea is number one in the Spanish market for several verticals: music festivals, independent music conferences, and do-it-yourself events. The company currently has 65 employees working in its headquarters in Madrid. In 2015, the company plans to sell over €50 million in transaction volume, consolidate its position in current markets, and grow its international footprint.